5* Free Play on Alabama (-7). While we do believe Alabama will be able to pull away late in this game to secure the win and ATS cover, we don’t rate this play high enough to release as a premium selection. But there is still value in backing the Crimson Tide, who erased all doubts about potential weaknesses with a shutout win against a good Michigan State team in the CFP Semifinals. Alabama’s rush defense completely shut down MSU’s running game – something Oklahoma was unable to do when Clemson beat them. 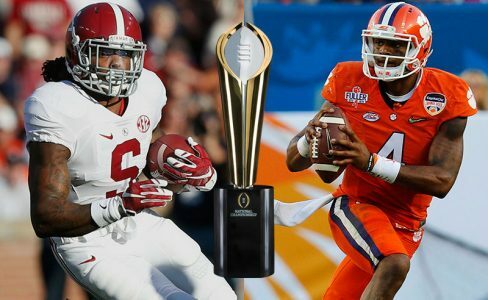 Without a working rushing game, we’re not convinced Clemson will be able to succeed offensively, and while we still have concerns about Alabama’s passing attack (still not sure why MSU couldn’t defend the deep ball), the Crimson Tide will be able to control field position and TOP with their running game. Clemson cruised through a very weak ACC schedule and came up big last week, but we still aren’t ready to believe they are truly the best team in the country. Tide’s defense and running game is a big edge that Clemson can’t overcome! 5* Free Play on Alabama. While Sam Martin is passing on the National Championship Game, he will have his NFL Playoff picks up in the next few days – jump on Sam’s long term winning run in NFL and cash in big this weekend w/ the Whiz Kid!